The Bicycle Film Festival is a travelling, international showcase of cycling related cinema. 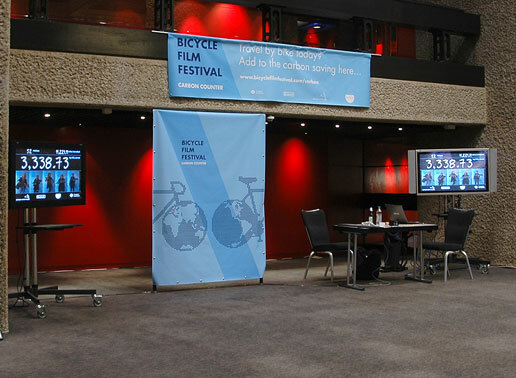 For the London leg in 2008 it was hosted at the Barbican and featured a symposium with representatives from TFL, Bikeoff and numerous cycling groups around Europe. As part of the festival I was commissioned to create a simple carbon counting system and picture gallery to enable the festival to calculate the impact of visiting cyclists. Installed for the duration of the festival the system utilised carbon data from the AMEE, distance calculation from Google Maps and photo management from Flickr. From a postcode a web application calculates a volume of CO2 saved over the journey to the Barbican by using a bike instead of a bus, tube or car. Each visitor could then have their picture taken displaying their personal saving and adding to the online and onsite gallery. The overall total and image gallery were displayed on 2 screens on site and also on the Bicycle Film Festival website.